I sit writing this blog post in the room pictured above. It’s a room I love, it’s my writing room. It used to be the ‘spare room’ but I have converted it into my little piece of bookish bliss! I am currently sharing my space with the contents of the bathroom due to ongoing building works. I think our tiny bathroom is, in fact, a Tardis judging by the amount of paraphernalia that surrounds me. Ah, the beloved foot spa, such a great idea, but sadly never used. Maybe I could use the foot spa and write at the same time? Now there’s a thought! I am very lucky to have such a wonderful place to write. The room is at the front of the house. It overlooks a field of horses. It is a lovely place to write, and to daydream in equal measures. Most of the time I am joined by Poppy my English Springer Spaniel. She will do one of two things. She will sit under the desk at my feet or, she’ll look for adventure.Guess which one I prefer? I am ashamed to say she has mastered the art of bin diving! I can often be seen raising my voice and running across the landing, in hot pursuit of a dog with an empty ink cartridge or worse, a chocolate wrapper! She chooses her moments with absolute precision, running off at exactly the moment I need to apply myself to a particularly complex piece of dialogue, or a red pen edit. She is a cheeky madam! 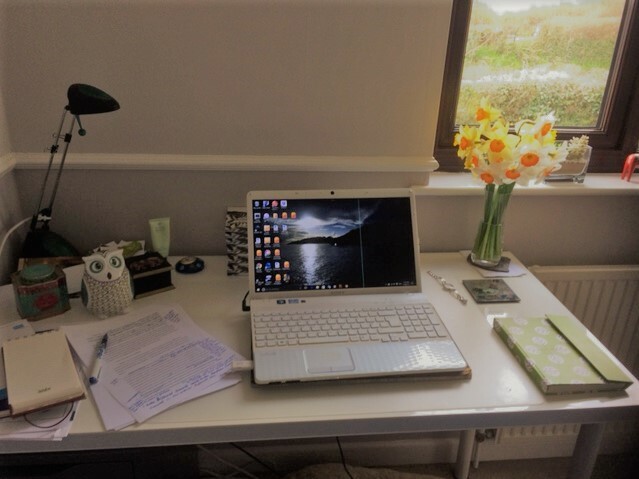 I do like a reasonably tidy desk. The same can not be said for the floor. No, I will not take a picture of the floor – trust me you really don’t want that image in your head.The floor usually sports three or four pieces of research in the form of open books, sheets of handwritten notes and photographs. This is another part of the bored dog vs human adventure that regularly takes place. I have learned only to place items on the floor that can be easily replaced. Sprinting is not my special talent. Some of my books are literally ‘dog eared’. Well I had better get on…. that book won’t write itself and I need to provide some entertainment for the dog!